Residential real estate in Cambridge and Somerville has appreciated significantly. In the past year, the median price has increased 13% in Somerville and 15.7% in Cambridge. Even after these gains Cambridge and Somerville real estate is still undervalued relative to many cities around the globe. Greater Boston has internationally renowned universities, hospitals, and pharmaceutical and high tech companies. As a result residents and investors from all corners of the globe are attracted to the area. Cambridge and Somerville are among the top cities in the area with international residents and buyers. The international prestige of Harvard, MIT, and Tufts add to the attraction to Cambridge and Somerville. Sale prices in desirable international cities such as Boston, New York, London, Paris, and Hong Kong have shattered records in the past 2 years. A condo at 15 Central Park West in Manhattan sold for a record $88 million at the end of 2011. The sale price per square foot was an astounding $13,000 per square foot. Record setting sales look to continue. A triplex penthouse at the Pierre Hotel in Manhattan has been listed for $125 million, a Frank Gehry apartment in Hong Kong sold for $61 million, and a penthouse at London's One Hyde Park condominium sold for a reported $219 million. By the measure of many other international cities, Cambridge and Somerville are highly undervalued. Both Cambridge and Somerville offers comparable economic, cultural, and entertainment opportunities as other cities with much higher real estate values. Average prices per square foot values in Cambridge and Somerville are dramatically lower than values in New York, Paris, London, Hong Kong, and many other cities in Europe, Asia, and North America. 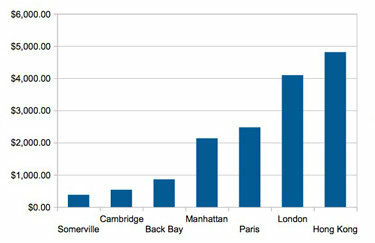 The average prices per square foot in 2013 for condos in Cambridge is $537 and $380 for Somerville. This compares to $2,135 in Manhattan, $2,475 in Paris, $4095 in London, and $4,810 in Hong Kong. Data Sources: Local data is from MLSPIN. Global data is from KnightFrank and reflects 2012 data. The KnightFrank data does not specify property type.